4. 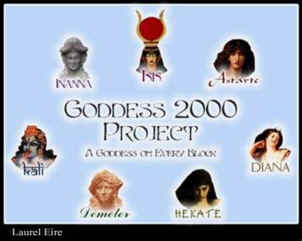 This is the Project NAgers - Goddess 2000. 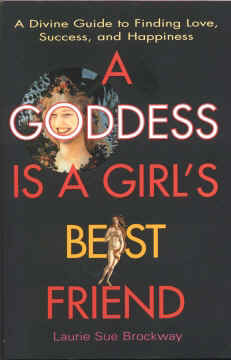 «A Goddess in every block». On the poster there are the portraits of the Satanist goddesses: Inanna, Isis, Astarte, Diana, Hekate, Demeter and Kali. 5. The New Age book for teenagers. According to the doctrine of New Age which has been put forward by its theorists Helena P. Blavatsky, and then by Alice A. Bailey, the mankind developed through several “root races”: the Lemurian, the Atlantean, and the Aryan. Each of these three (which Theosophists call "root races") is divided into "sub races" - stages representing steps upwards to the following race, in which the mankind got new qualities and abilities. These ages, as they think, change every 2000 years and are reflected in astrological signs. Mankind is now in the stage of moving between the two ages of our «planet evolution» and is about to enter to the sixth sub race of the Aryan root race – the Age of Aquarius. To reach a new evolutionary step mankind should make collective huge “quantum leap” through evolutionary interval to new gold age, when on earth there will be only one common nation, one language, one government, one religion, one money-credit system. There will be no hatred, no violence, no wars, no crimes, illnesses, even death! Only love will rule the world.... 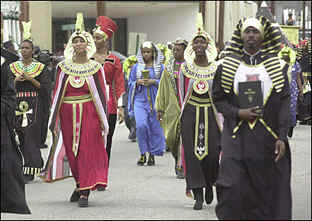 This Utopia is largest threat to Christianity - larger, than any other cult. New sub race is considered new, "mutated" species of man: Homo Noeticus.. John White (International Cooperation Council Directory, 1979, p.13-15) explains, that homo noeticus is "a newer and higher form of humanity taking control of the planet... while the older species [Homo sapiens] dies out from a massive dose of irrationalism." " Outwardly these mutant humans resemble the earlier forms. The difference is inward, in their changed mentality, in their consciousness." * Yes, the same Aryans whose origin nazis of high ranks bragged of.